It is very hard for me to pass up opportunities to run with Joy. She loves to run and I love to watch her run. When we run together, she never fails to ask me “Are you ready? !” energetically and when I say “Yes!” with the enthusiasm she expects, she breaks into a run at the fastest speed she can manage. All out or nothing. She doesn’t wait for me. She may or may not run in a straight line or, look where she’s going. 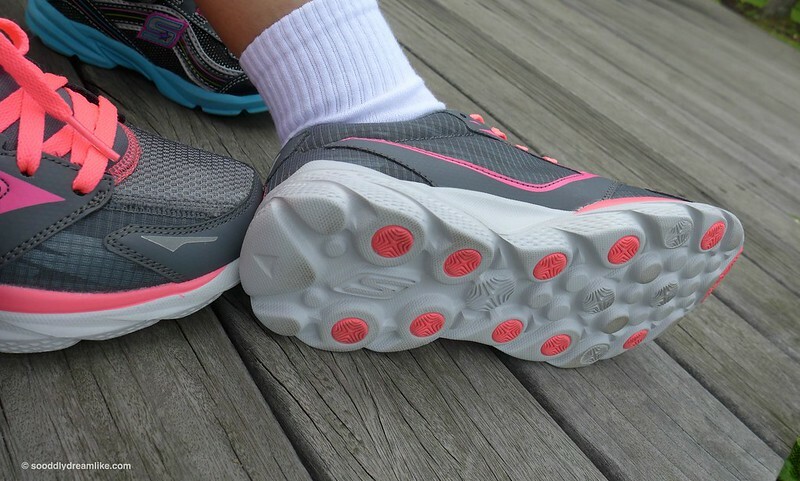 We were to run in our new Skechers shoes for Shape Run this year but had to give it a miss because Joy fell ill the night before. Both of us were bummed. I just read about how the run went for Summer, Cherie and Mabel, it looked like they had loads of fun. 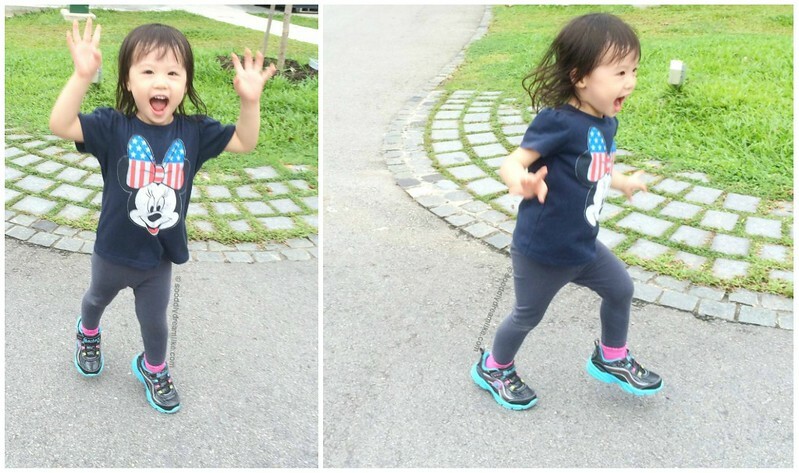 Something interesting – Summer’s daughter, Angel and Joy (who incidentally share the same birth date, two years apart) both picked Skechers’ Twinkle Toes for the run. 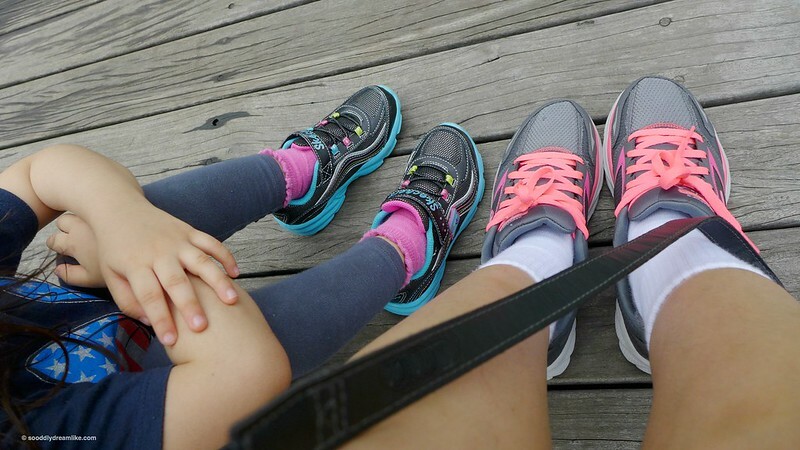 Joy’s mama got her another pair of shoes to make sure she has proper ones for the run, but Angel’s took the chance to teach her a lesson in responsibility for her own choice. I love how she handled it, good teachable moment. When I run with Joy, we take several breaks in between, not so much because we’re exhausted, more to stop and chat or look at things. At the moment I took this photo, we stopped on a bridge to look at fishes in the water beneath us. My new GOrun Ride 3 helps me much in running because it is so light. According to Cherie (she actually weighed it), the pair weighs just 180g. Doesn’t look like it but the cushioning I get from this pair is like what you might get from one of those bulky running shoes. I didn’t know it is possible to wear a pair of running shoes, be well cushioned and not feel any obvious weight. My feet is wider at the joints just under the toes (can’t remember what they’re called now) and that usually means they’re squashed in closed shoes. I like the mesh design of this pair, it accommodates my feet, doesn’t make me feel like they are squashed but yet wraps around securely and protectively to cushion my moves. I admit, I can be shallow. If a pair of footwear is pretty enough, there’s a chance I’d choose it over more comfortable ones. Not a problem here though, this pair is comfortable and good looking. Cherie spotted a black and gold version (Swoon! Read her post to see it!) and there is a hot pink version which I wanted to get initially. I think they (Skechers) got everyone’s color preferences covered. Matchy shoes or not, she’s happy. I hope she’ll always stay this way. It’s a pity that Joy can’t fit into a matching pair yet. We’ll wait till she can. I have a feeling that it might not take too long. 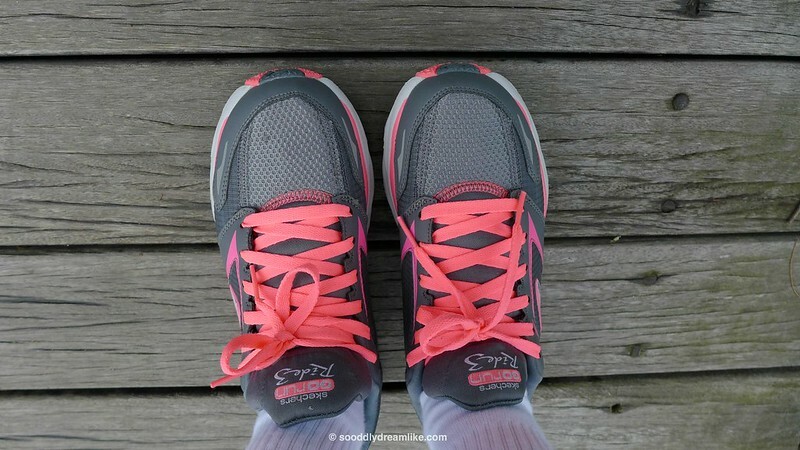 Disclosure: Skechers sponsored our registration for Shape Run 2014, and we were gifted with a pair of Skechers GORun Ride 3 for myself and a pair of Twinkle Toes for Joy for the run. Happy times and opinions herein are purely our own. Big thanks to Lynette of Skechers, who told me not to worry about missing the run, because Joy’s health is most important. I keep simple records of our daily life on my Dayre. I also use Instagram and update my Facebook Page pretty often. To keep all sorts of ideas, I pin them to my Pinterest. If you enjoyed reading this post, connect with me on the various platforms I'm on and you won't miss an update! 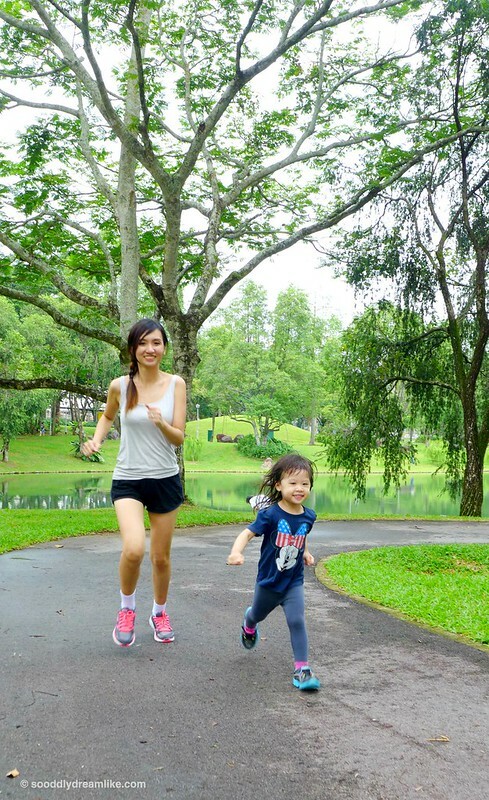 And the running pics of you and Joy! Eh how come when you run you look so glam. When I run, I look so auntie!! LOL. Not glam la, illusion. I wear the same comfortable get up to sleep you know. By the way, “Auntie” is a badge of honor, to me.